You can imagine the need for focusing by envisioning a street corner. If this is an intersection of two wide avenues, people can probably walk past each with little chance of collision. But if it’s a very narrow space with just enough of a crowd, people may be forced into each other. As it’s these collisions that scientists are after, the particle bunches need to travel in a tight pathway to increase the collisions achieved. For a more scientific analogy of how this funnelling of the beam’s path is achieved, Fermilab scientist Elvin Harms likens final focus to a telescope. “You might say the final focus quadrupole circuits are like a telescope. There is strong focusing near the collision point—much like an objective lens—and weaker focusing—like an eyepiece—further away,” Harms says. This series of quadrupole magnets spans roughly a kilometre of space in the International Linear Collider design with the interaction point at its centre. Scientists can adjust each magnet to either focus or defocus, winnowing down or expanding space within the vertical or horizontal planes. At the ILC a doublet—or two quadrupole magnets—will be placed on either side of the interaction point. By the time particles collide they will each travel in a stream far smaller than a human hair, a scant 5.9 nanometres vertically and 474 nanometres horizontally. 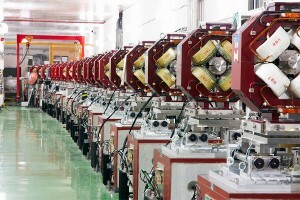 ATF2 is a test facility at the KEK laboratory in Japan which contains a prototype of an advanced optics design of the final focus for use at any future linear collider. In December last year, scientists achieved a squeezed beam size as small as 70 nanometeres at ATF2. Scientists aim to achieve as final goal a spot size of 37 nanometres – the beam size to meet the ILC requirements. Read also Linear collider focus gets down to size in symmetry magazine.